In this case study, a model described in the “You Only Look Once” (YOLO) project is used for object detection. The model consists of two components: a convolutional neural network and a post-processing pipeline. In this work, the original Darknet model is converted to a TensorFlow model. First, the convolutional neural network is optimized for inference. Then array programming with NumPy and TensorFlow is implemented for the post-processing pipeline. Finally, environment variables and other configuration parameters are tuned to maximize the computational performance. With these optimizations, real-time object detection is achieved while using a fraction of the available processing power of an Intel Xeon Scalable processor-based system. Colfax-Real-Time-Object-Detection.pdf (411 KB) — this file is available only to registered users. Register or Log In. Why are some sections grayed out? You are viewing an abridged version of this publication. To view the full version and download a printable PDF, please register or log in. 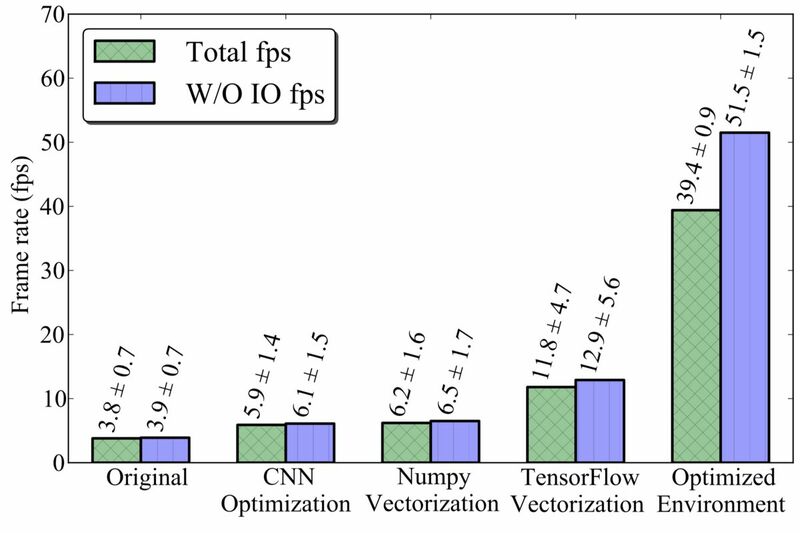 The advancement of convolutional neural networks (CNNs) and deep learning (DL) in the past decade brought about significant improvements in computer vision. One of the beneficiaries of these advances is the task of object detection, where the objective is to detect and locate real-world objects inside images or videos. This differs from basic image classification in that the machine learning model has to detect multiple objects in a single frame, and also determine where these objects are located. 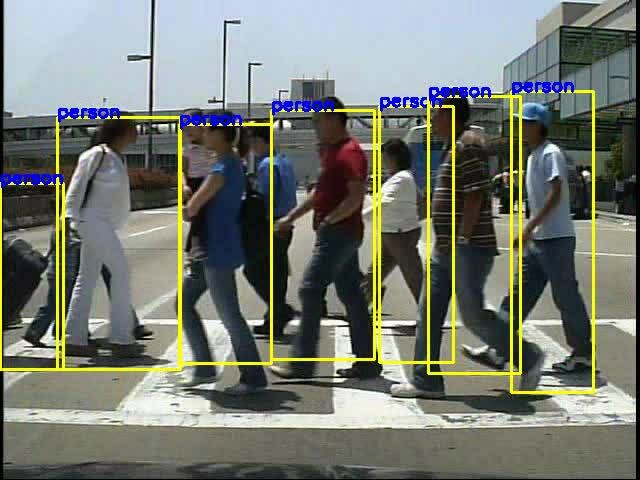 Figure 1 below shows an example of object detection. Recent research efforts, such as Faster R-CNN, Fastest DPM and YOLO (see also this blog post), have greatly improved both accuracy and speed of object detection. The advances in techniques, combined with the improved computer hardware, put real-time object detection well within the capabilities of modern processors. Achieve real-time frame rate and latency. There is no universal definition of real-time frame rate. Instead, the definition of “real-time” is the “same rate as the input”, so the required frame rate will depend on the application. There are three reference point values used in this paper: 15 fps (common frame rate of CCTV cameras), 24 fps (typical frame rate of movies) and 30 fps (frame rate used for Caltech Pedestrian Dataset). The unit “fps” stands for “frames per second”. Frame rate is a good metric for applications where the processing throughput is more important than the latency of processing a single frame. Offline processing of video streams is an example of such an application. In contrast, there exist applications that require object detection in a frame as fast as possible. For example, self-driving vehicles need to respond to the road conditions fast, and object detection speed in this application is best measured by latency. Depending on whether an application needs a high frame rate or low latency, object detection can be approached differently. For latency minimization, one may choose to use all the available resources to process a single frame at a time, even if it leads to sub-optimal utilization of a powerful computing system. For throughput maximization, the mini-batch approach (processing several frames at once) may be better as it takes better advantage of a parallel computing system. Finally, if the latency is important, but mini-batch results in an acceptable latency, then this approach can minimize the utilization and free up the processing power for other tasks. The aim of this work is to meet the required frame rate or latency while using the minimum amount of computing resources, and both the single-frame inference and the mini-batch approaches are studied. This project is using the algorithm proposed in the YOLO project, which is described in Section 3. Original work on YOLO used the Darknet neural network framework, but for this work the network is implemented using TensorFlow. The target platform for this paper is an Intel Xeon Scalable processor (formerly Skylake) from the Platinum group. These are highly parallel socket-mountable server processors with a large number of physical cores and support for AVX-512 vector instructions. The test system used in benchmarks contains 24 cores per socket, with total of 48 cores in a dual-socket system. You are viewing an abridged version of this publication. To continue reading and download a printable PDF, please register or log in. The frame rate measurements presented in this section are conducted on a Colfax CX1260i-T-X7 server based on a dual-socket Intel® Xeon® Platinum 8160T processor with 192 GB of DDR4 memory at 2400 MHz. The processor has 24 cores per socket with 2-way hypert-hreading, so this system has 48 physical cores presenting themselves as 96 logical processors. The operating system used is CentOS 7.4. Python 2.7 from the Intel Distribution for Python 2018 is used with TensorFlow version 1.4.0 and OpenCV version 3.3.1-dev. The computation rate is reported as throughput in units of frames per second (fps). For single-frame inference, the effective frame rate is related to the processing time (latency) according to Equation 3. For mini-batch inference (object detection in several frames concurrently), the frame rate is computed from the time (latency) it takes to process the mini-batch as shown in Equation 4. Single-frame inference is the usage scenario when object detection in a given frame must be performed as fast as possible — for example, in a self-driving vehicle. Mini-batch inference may allow the user to process more frames per second than single-frame inference, but the application must wait for the entire batch to finish processing before any result can be used. This approach will generally have worse latency, but better frame rate than single-frame processing. The mini-batch approach is useful in offline data processing, when the latency less important than throughput. It can also help to achieve a target latency with fewer cores. Mini-batch size of 1 is equivalent to single-frame processing. Figure 2 shows the frame rate gains due to the optimizations presented in this paper for single-frame processing (i.e., a mini-batch size of 1). Figure 2: Impact of code optimization. Each measurement is done over processing of 500 frames, with time for each frame measured independently. The times for the first 100 frames (≈3 seconds) are ignored in order to avoid fluctuation from issues like initialization and leaving CPU power saving states. The average times and the standard deviation is reported from the latter 400 frame times. For these benchmarks, the number of threads is kept constant at 8 threads, or one-sixth of the total computational capacity. Two values for frame rate are reported: total frame rate and frame rate without I/O. Total frame rate includes the time taken to load the frames and display them in OpenCV, so this number is dependent on the some external factors like the properties of the video capturing device. For the benchmark setup, the I/O took up to 20% of the total wall-time. The frame rate without I/O is reported to give the best-case speed of the application. In Figure 2, Original represents a naive model consisting of CNN with batch normalization and postprocessing from Listing 1. CNN optimization is the network optimization presented in Section 3. Optimizations for the NumPy Vectorization and TensorFlow Vectorization cases are discussed in Section 4. Finally, Optimized Environment is discussed in Section 5. All optimizations combined deliver 10x improvement for the total frame rate and around 13x for frame rate without I/O. The optimizations discussed above were also applied to YOLO-V2 CNN. 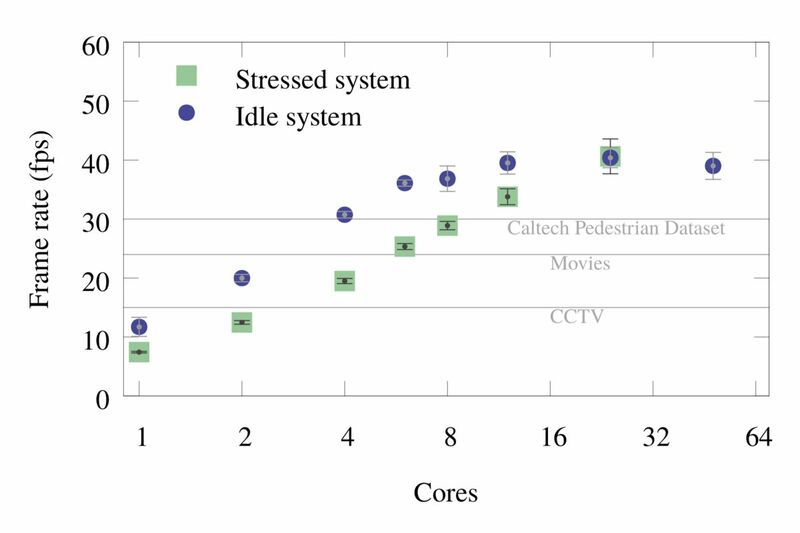 Figures 3 and 4 below show the total frame rate with respect to number of cores for “stressed” and “idle” systems for both Tiny-YOLO and YOLO-V2 CNN models. Figure 3: Tiny-YOLO: Single-frame inference timing, including I/O. Figure 4: YOLO-V2: Single-frame inference timing, including I/O. The same data is shown in tabulated format in Table 2 and 3. Table 2: Tiny-YOLO: Single-frame inference timing. The values are in frames per second (fps). Table 3: YOLO-V2: Summary of frame rate measurements in fps.The values are in frames per second (fps). In the “idle” run, the object detection application is the only computationally heavy application running on the system. In the “stressed” run, the object detection application is run on a subset of the cores, and the rest of the cores are used for a large matrix product calculation (Intel MKL SGEMM). This test simulates multi-tenancy, where a server is running many applications concurrently. There is a large difference between the two scenarios for low core count benchmarks, largely due to the Intel Turbo Boost feature of the processor. When the CPU utilization is low, as in the case of low core count “idle” runs, the processor is allowed to increase its frequency up to the maximum Turbo frequency as long as the power consumption on the CPU is below the threshold value (TDP). For the CPU used in this benchmark, the frequency can scale from the maximum Turbo frequency of 3.0 GHz to the base frequency of 2.1 GHz. For more on Turbo Boost in Intel Xeon Scalable processors, see this paper. In contrast, for the “stressed” runs, the CPU is fully occupied even when few cores are used for object detection, so it does not benefit as much from the Turbo Boost. The difference between the “idle” and the “stressed” speed reduces as the core count is increased, and it goes away when one CPU is fully utilized (24 cores). Note that the Turbo frequency is set based on the core occupancy of a socket, so the difference goes away at 24, rather than 48, cores because it does not matter if the second socket is utilized or not. For Tiny-YOLO model, each core constitutes 2.1% of the total computational resource of the test system. For the idle system, the low CCTV frame rate of 15 fps can be achieved with just 2 cores, and both the typical movie frame rate of 24 fps and the Caltech Pedestrian Dataset frame rate of 30 fps at 4 cores. 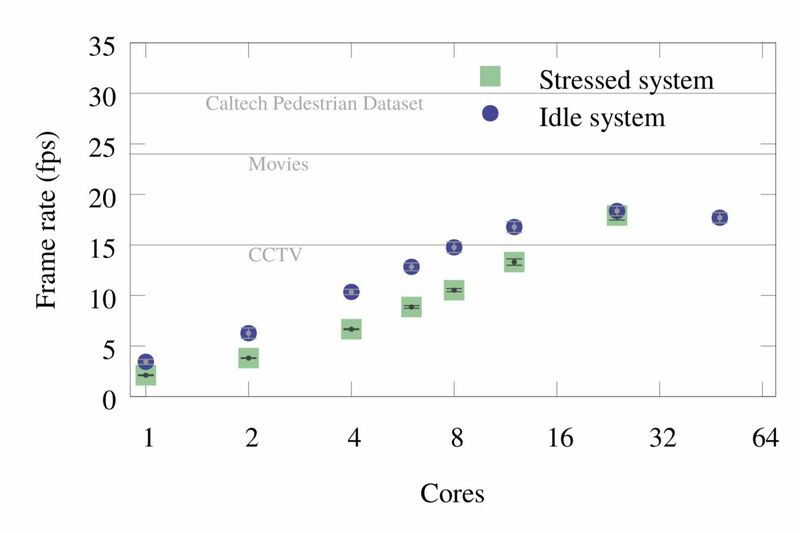 For the fully stressed system, the required resources are 2 cores to achieve CCTV frame rate, 6 cores for a typical movie frame rate, and 8 to 12 cores for the Caltech Pedestrian Dataset frame rate. These serve as maximum and minimum cases for the system utilization outside the detection workload. So in real-case scenarios, where the object detection is running concurrently with other workloads, the required core count will fall somewhere in between the values. The speed without I/O that we quote can potentially be achieved, for example, if the I/O is done on a separate thread. In this case, the 30 fps mark is achieved with 4-6 threads. YOLO-V2 model has 23 convolution layers compared to 9 convolution layers in Tiny-YOLO. It has an increased object detection precision at the cost of speed, which is quite evident in the frame rate plots. The YOLO-V2 model requires at least 12 cores to reach the CCTV frame rate of 15 fps. Finally, there are two important notes about this result. MKL integration into TensorFlow is in its early stages, an Intel MKL is continually upgraded. Although this is already an impressive showing, the floating-point operation rate of the “Tiny YOLO” model for single-frame inference is still short of the theoretical peak floating-point operation rate of the test system. According to the authors of YOLO, “Tiny YOLO” inferencing requires 6.97&cdot;109 floating-point operations. Using our measured frame rate, this number can be translated to floating-point operation rate in GFLOP/s (billions of floating-point operations per second). The single precision theoretical peak of the test system in the “idle” scenario is 1.54 TFLOP/s with 8 cores and 3.07 GFLOP/s with 24 cores. The timing of of “Tiny YOLO” translates to 331 GFLOP/s with 8 cores or 391 GFLOP/s with 24 cores. This amounts to an efficiency of 22% and 13%, respectively. As Intel MKL and TensorFlow improve, the required computational resource may decrease even further. The low efficiency and poor frame rate scaling with core count is due to the self-imposed limitation of single-frame reference (i.e., batch size of 1) in these tests. Modern processors are highly parallel, and there aren’t enough independent parallelizable elements in the workload with a batch size of 1. At larger batch sizes, the object detection frame rate scales better with the number of cores. Mini-batch inference timing is described in Section 6.5. In this section, the timing results for mini-batch inference are presented. In all test cases, 24 cores (i.e., one complete socket) of the processor are used. 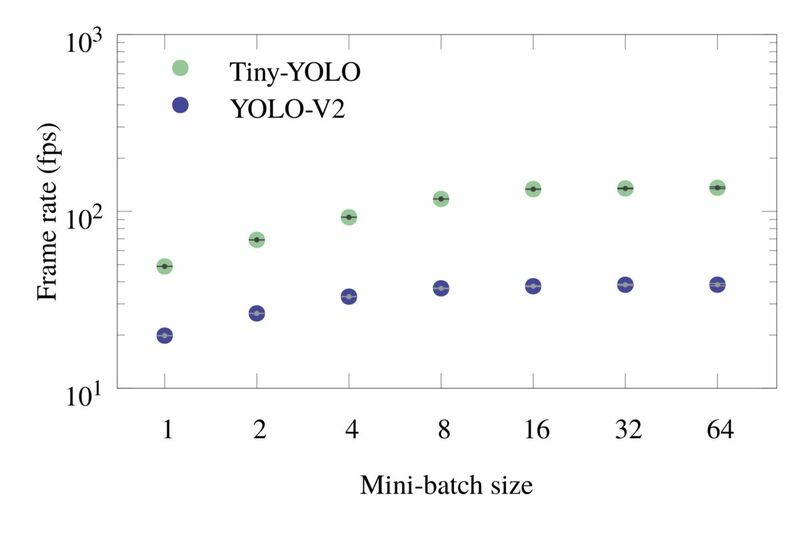 Figures 5 and 6 show the frame rate and latency plots for mini-batch inference for both Tiny-YOLO and YOLO-V2. The horizontal markings in the latency plots are of special importance because they show the required minimum latencies of Caltech pedestrian dataset, Movies and CCTV for mini-batch size of 1. Figure 5: Frame rate for mini-batch object detection with 24 cores, without I/O. Figure 6: Latency for mini-batch object detection with 24 cores, without I/O. The data used for these plots is summarized in Tables 4 and 5. Table 4: Batch inference frame rate with 24 cores. Table 5: Batch inference latency with 24 cores. Processing several frames at once in a mini-batch utilizes the resources more efficiently. For instance, with 24 cores, Tiny-YOLO with a batch size of 8 delivers 836 GFLOP/s (27% efficiency) and with a batch size of 64 it operates at 949 GFLOP/s (31% efficiency). 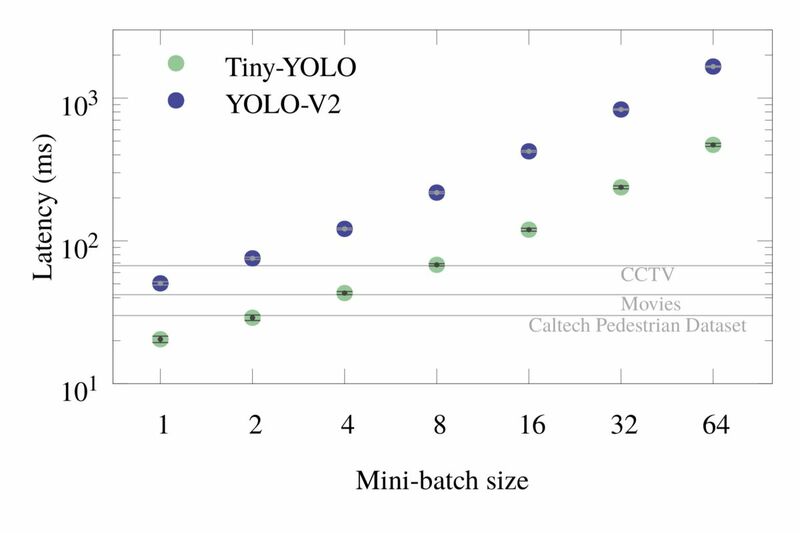 The heavier model YOLO-V2 with a batch size of 64 delivers 1350 GFLOP/s, which is 44% efficiency. As a consequence, mini-batch inference with a large batch size should be the default strategy for offline image processing, when the latency is not important. This publication presents the optimization path for real-time object detection inference (based on the YOLO model) with TensorFlow. Observations of this work are characteristic of modern applications for highly-parallel processors. That is, the speed of the application and the efficiency of resource utilization depend critically on the design of the code and on the parallel strategy. Resource partitioning and parallel algorithm control with environment variables and Linux tools. The techniques mentioned above do not change the nature of the calculation, but, rather, make the application execute closer to the underlying hardware. Cumulatively, the difference in the calculation speed between a correct but inefficient code and the final optimized version was observed to be 13x. Secondly, the measurements presented here show that the tradeoff between the computation speed and detection precision can be a tuning parameter of an artificial intelligence system. Substituting the Tiny-YOLO model for YOLO-V2 increases the frame rate by 2-3x at the cost of less accurate object detection. In a scenario where a single video feed is processed in real-time (e.g., a self-driving vehicle), the user can choose just enough CPU cores to handle object detection at the required frame rate. For instance, our benchmark system needs to dedicate 8-12 cores to detect objects in a 30 frames per second video feed, while the rest of the cores can be assigned to other tasks. In a scenario where multiple video feeds are processed (e.g., surveillance footage from multiple cameras), the user can choose to process object detection on a mini-batch of frames coming from the different feeds, rather on than a single frame. This would increase the amount of data the system can handle. In setup, the single-frame strategy allows each 24-core socket to process 3 (three) CCTV feeds, while the mini-batch strategy increases the capacity to 8 (eight) CCTV feeds, still maintaining real-time latency of 1/15th of a second. The methods discussed in the paper are applicable to a broad range of data analysis and machine learning tasks targeting modern Intel architecture processors.